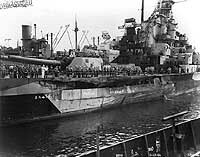 In the pre-dawn darkness of 1 February 1944 the battleship Indiana turned to leave the cruising formation of Task Group 58.1. 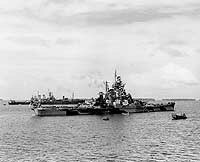 Consisting of three aircraft carriers, three battleships, a light cruiser and nine destroyers (**: ships are listed below), TG 58.1 was steaming at ninteen knots through the Marshall Islands, supporting the invasion of Kwajalein Atoll. Indiana was under orders to refuel four destroyers, to be done at night to ensure a full anti-submarine screen during the following day's combat operations. Indiana announced by radio at 0420 that she was turning towards the left and slowing to fifteen knots. However, her Commanding Officer, based on a "seaman's eye" evaluation of the situation, apparently thought better of that course and a short time later changed direction toward the formation's right. This was not reported to the rest of the ships and, about seven minutes after she began her turn, Indiana was seen close ahead of the battleship Washington's port bow. The latter ordered her engines to "back, emergency full" and put her rudder hard left. 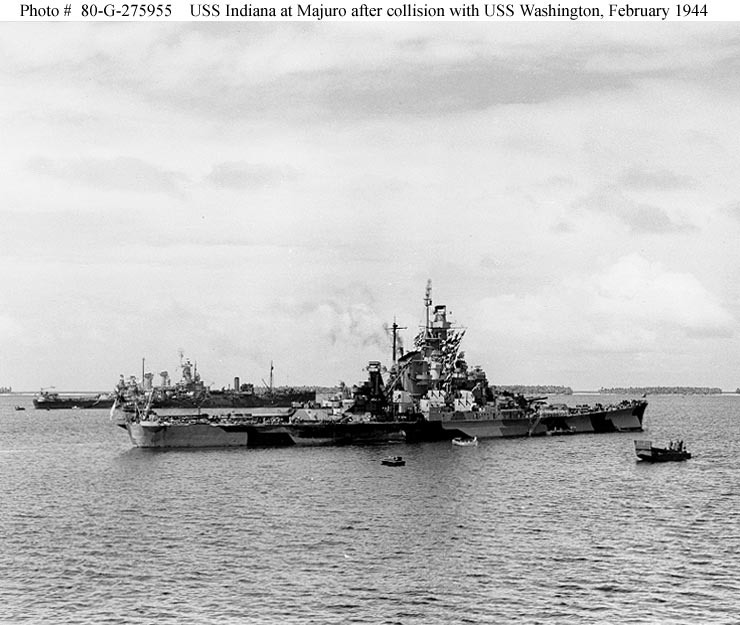 Indiana also maneuvered in an effort to avoid a collision. However, in about a minute the two big ships ran together, with Washington's bow scraping down the after portion of Indiana's starboard side. 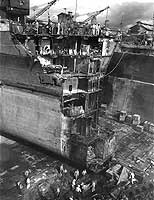 Both ships were damaged enough to require shipyard repairs, taking both out of combat at an inopportune time. 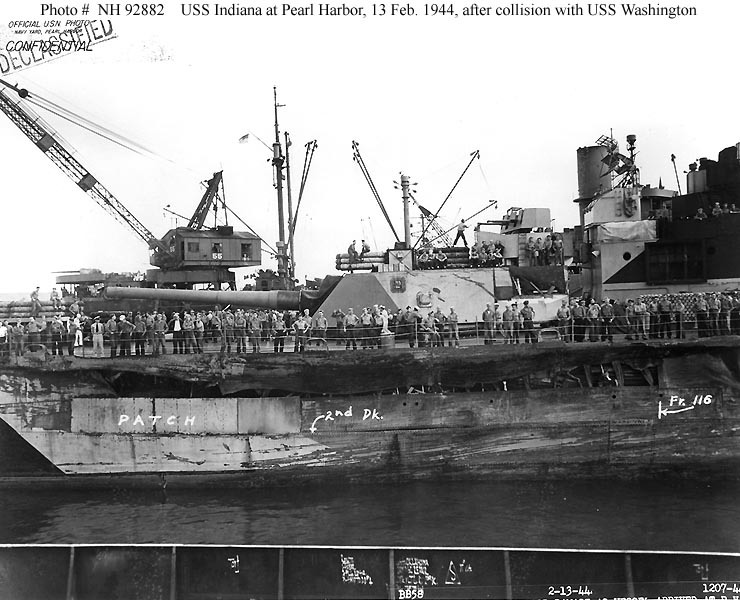 Indiana's starboard hull side was dished in and ripped open. Above deck, her after sixteen-inch gun turret rangefinder was damaged, several machine guns were destroyed, and her starboard aircraft catapult and a seaplane were torn off. Some sixty feet of Washington's forward hull was ground away, causing its deck to flap down into the water. Ten lives were lost in this accident, six killed or missing on Washington and four on Indiana. The latter's Commanding Officer, whose actions were severely criticized by the ensuing court of inquiry, was relieved of command and not again employed at sea. In contrast, Washington's Officer of the Deck was commended for "prompt and seamanlike action which almost averted the collision and definitely minimized the consequences." To reduce future risks of such collisions, the court of inquiry also recommended changes in the training of heavy ship captains, officers of the deck and combat information center watch officers. As an indication of wartime industrial capabilities and priorities, both battleships were back in action rather quickly. 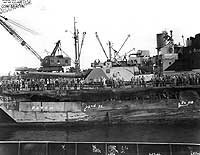 Indiana, repaired by the Pearl Harbor Navy Yard, was able to participate in late April 1944 raids on the Japanese base at Truk. The more seriously injured Washington went to the Puget Sound Navy Yard, which fabricated and installed a new bow in less than three months. She was back in the combat zone by the end of May, in time to take part in the June 1944 Marianas campaign. 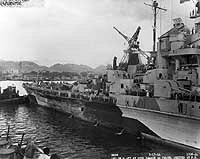 **: Task Group 58.1's carriers were Enterprise, flagship of Rear Admiral John W. Reeves, Jr. (Commander TG 58.1 and Officer in Tactical Command); Yorktown, flagship of Rear Admiral Marc A. Mitscher (Commander, Task Force 58); and Belleau Wood. 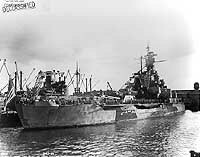 Battleships included Washington, flagship of Rear Admiral Willis A. Lee (Commander, Battleships, Pacific Fleet, and Task Unit 58.1.3); Indiana, flagship of Rear Admiral Glenn B. Davis (Commander Battleship Division 8); and Massachusetts. The light cruiser was Oakland. Destroyers assigned to TG 58.1 were Clarence K. Bronson (DD-668), Cotten (DD-669), Dortch (DD-670), Gatling (DD-671), Healy (DD-672), Cogswell (DD-651), Caperton (DD-650), Ingersoll (DD-652) and Knapp (DD-653). 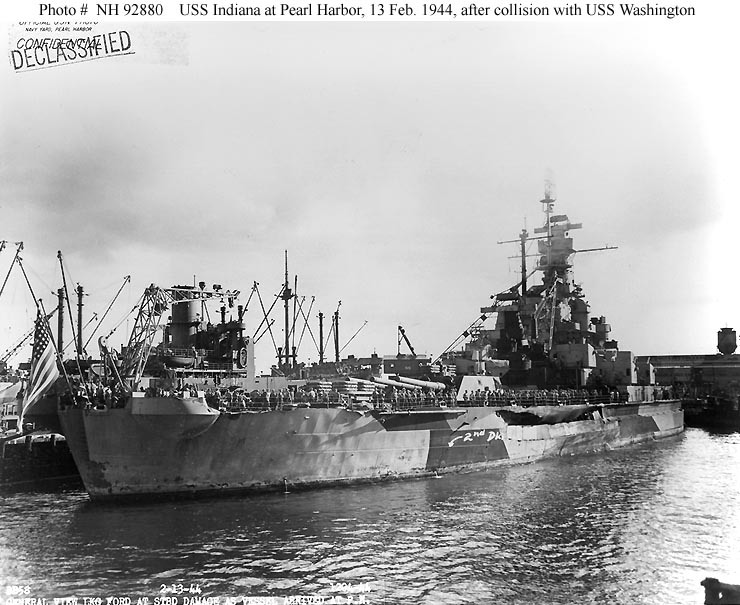 This page features all the views we have concerning the 1 February collision between USS Washington (BB-56) and USS Indiana (BB-58). Alongside USS Vestal (AR-4) for initial repairs, after colliding with USS Indiana (BB-58) during the Marshalls Operation, 1 February 1944. 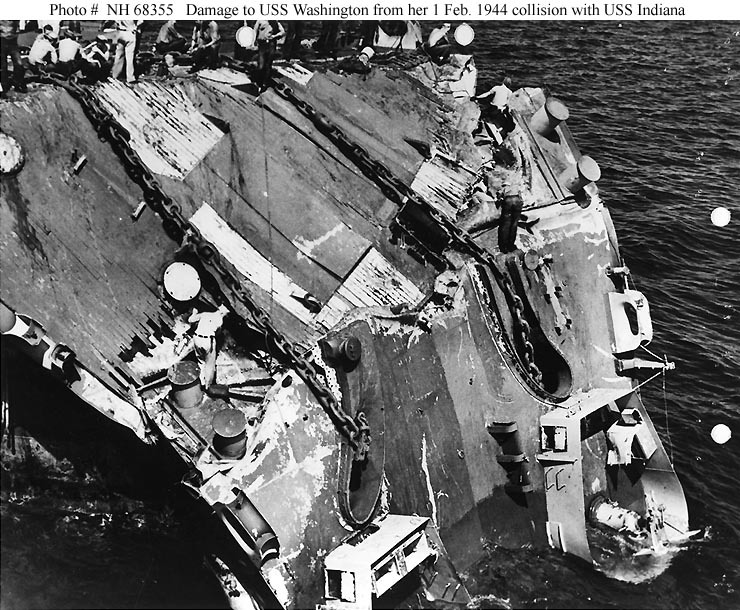 Note serious damage to Washington's bow. 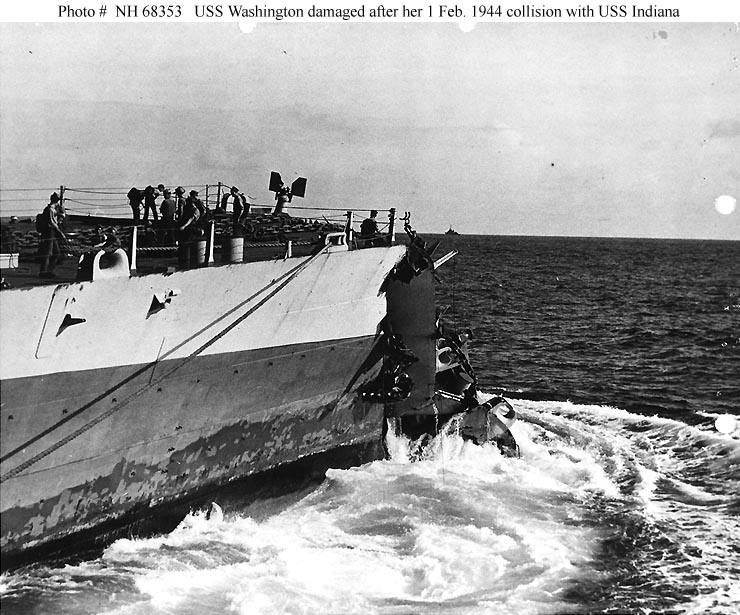 Underway with a collapsed bow, after colliding with USS Indiana (BB-58) during the Marshalls Operation, 1 February 1944. 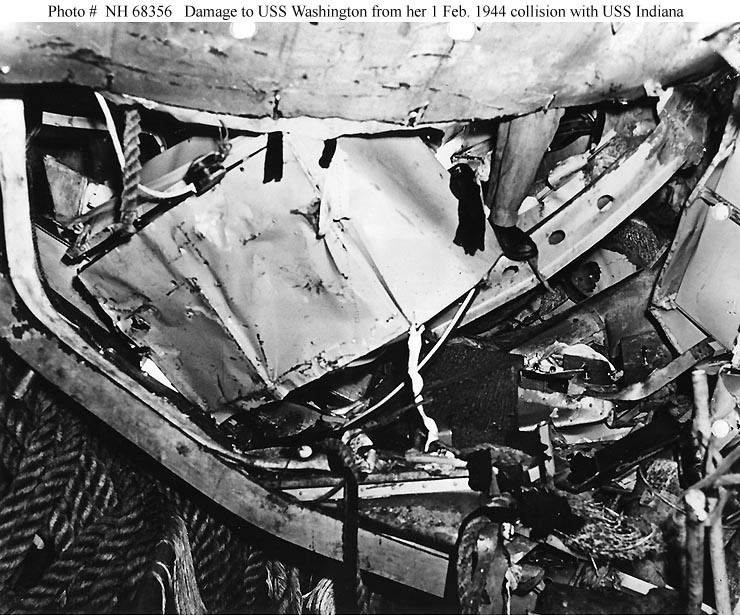 Damage received in her 1 February 1944 collision with USS Indiana (BB-58). 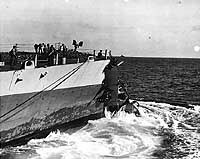 Note her collapsed bow, retained by anchor chains. Note accordian pleating of her side plating. View looks inboard through the opening in the hull forward of the starboard bow. 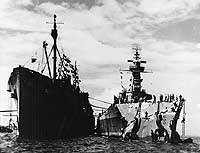 At Majuro Atoll for repairs on 3 February 1944. 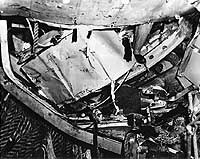 She had collided with USS Washington (BB-56) during the night of 1 February, while taking part in the Marshalls operation. 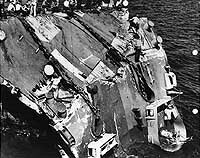 Damage to her starboard hull side is visible below her after 16-inch gun turret. 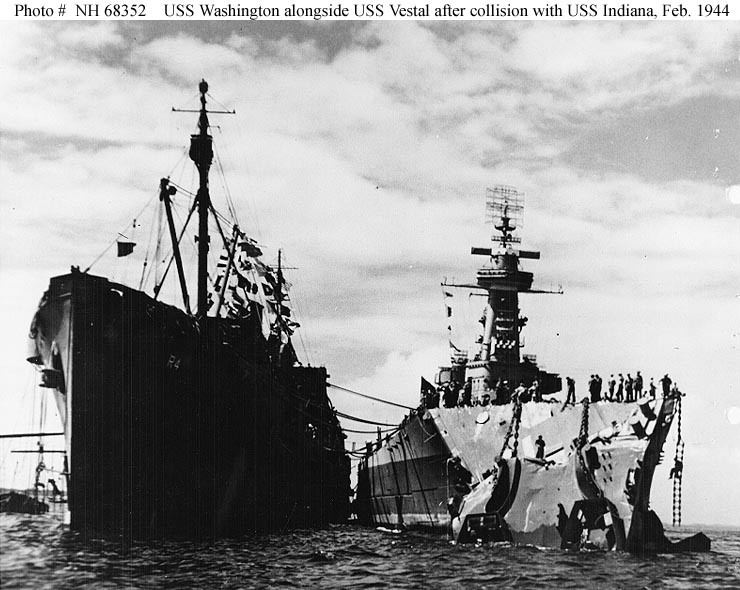 USS Washington, whose bow was wrecked in the accident, is in the left background, alongside USS Vestal (AR-4). 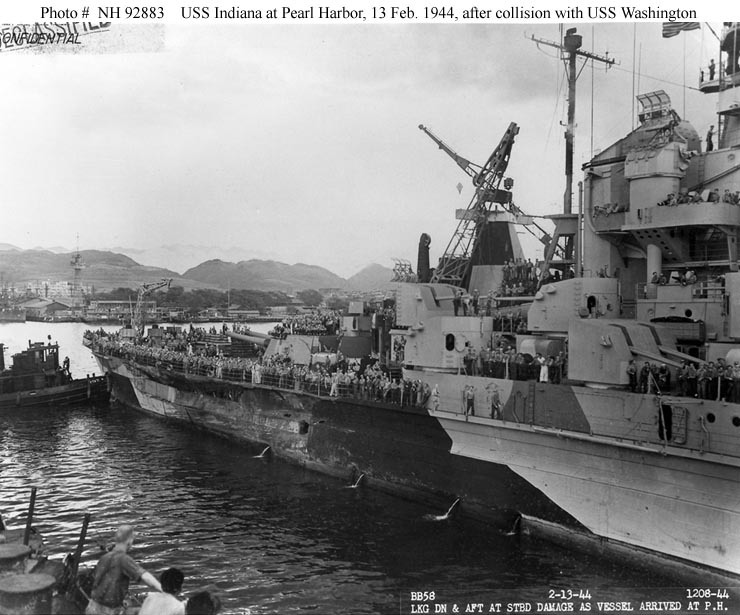 At Pearl Harbor on 13 February 1944, showing damage to her starboard side received in her 1 February 1944 collision with USS Washington (BB-56). 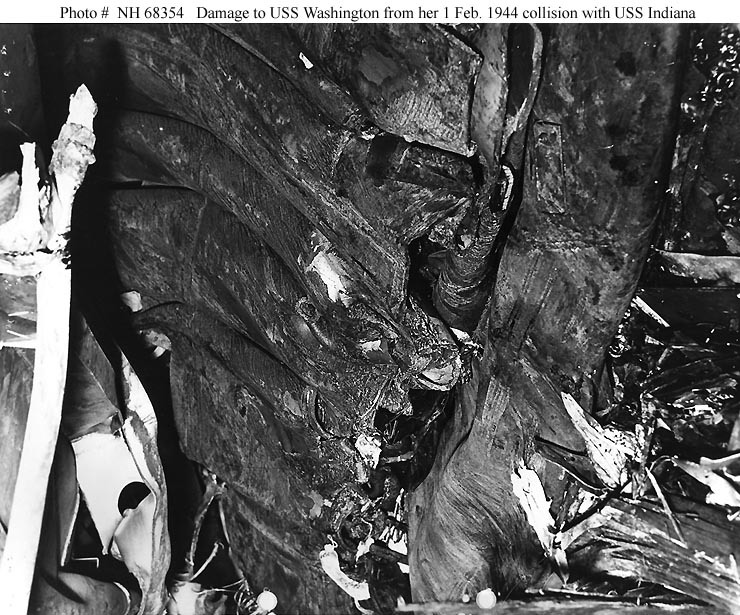 At Pearl Harbor on 13 February 1944, showing damage to her starboard side received in collision with USS Washington (BB-56) on 1 February 1944. Note the "cage" mast mounted ashore in the left distance. 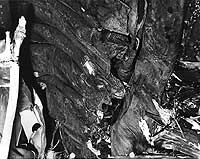 It was removed from USS California (BB-44) while she was being salvaged following the 7 December 1941 Japanese attack on Pearl Harbor. 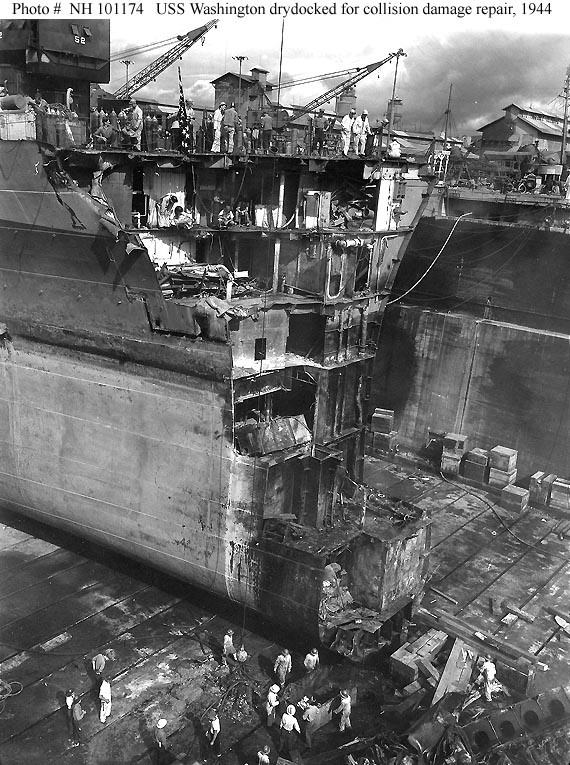 In drydock at the Pearl Harbor Navy Yard while receiving temporary repairs, circa March 1944. 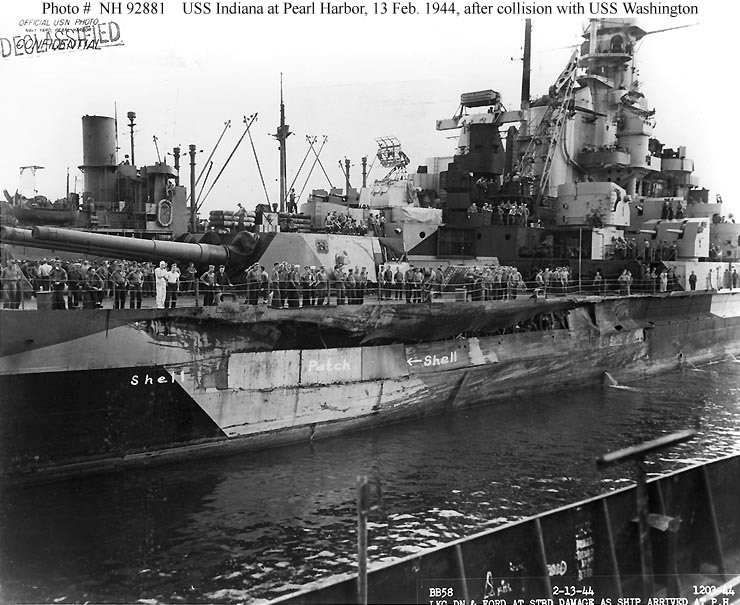 Her bow was crushed in collision with USS Indiana (BB-58) on 1 February 1944, during the Marshalls operation.